If you're like me you can't wait to toss your snow boots to the left, to the left! I'm scoping new kicks for spring and I think these are adorably fresh. 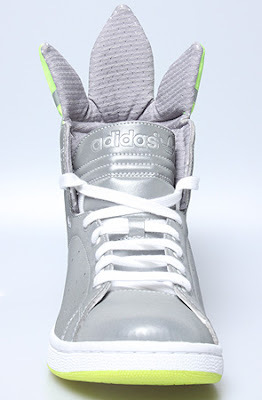 The Trefoil Hi W in metallic silver are high tops to the extreme. 80's babies will love the exaggerated trefoil symbol on the back that can be worn up or down, but really why would you want to wear it down? It's the icing on the cake of the sneaker. 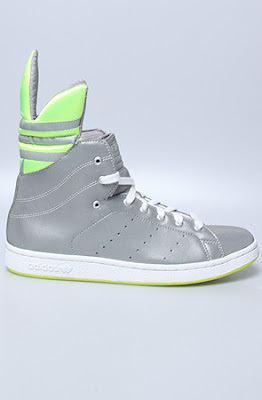 They also come in white, but really with sneakers coming in so many colors now does anyone wear all white anymore? 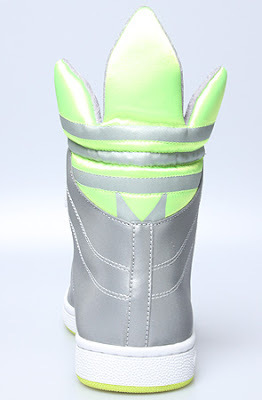 I would switch the laces for neon colored ones to really make them pop. You gotta rock this with loose fitting shorts or cropped cargo's so you can get the full effect from the shoe. These are definitely on the top of my list for Spring. Be bold babes! Price point $90.